Milton L. Collins, Associate Director of Minority Affairs for the Miami-Dade Aviation Department (MIA), is responsible for assuring that women-owned, minority-owned and local small businesses are provided every opportunity available to participate in contracting opportunities at Miami International Airport and the County’s four general aviation airports. 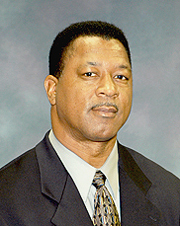 Mr. Collins currently has more than 31 years of experience with Miami-Dade County, spending 16 years with the Miami-Dade Elections Department as Deputy Supervisor of Elections. He has also held positions within Miami-Dade County such as Contracts Officer with the Department of Human Services and Productivity Analyst with the Office of Productivity Management. In his current position, he is responsible for increasing public awareness of minority participation opportunities with the Aviation Department through Disadvantaged Business Enterprise (DBE), Local Developing Business (LDB) and Small Business Enterprise (SBE) programs in the areas of goods, services, construction and design. He is also responsible for monitoring compliance of minority programs between prime and sub-prime contractors. Through his leadership of the Minority Affairs Division, MIA was the only U.S. airport to receive the Federal Aviation Administration (FAA) 2012 DBE Advocate and Partner Award and the Airport Minority Advisory Council (AMAC) 2012 Airport Concessions Award during the 2012 Airport Business Diversity Conference. MIA was recognized for significantly increasing Airport Concession Disadvantaged Business Enterprise (ACDBE) participation at MIA and for overall support of the FAA’s DBE program. The Minority Affairs Division strives to increase ACDBE participation at MIA. In fiscal year 2015, MIA received nominations for small business inclusion awards from two national associations: Airports Council International - North America’s Business Diversity Committee recognized and nominated MIA for its 2015 Inclusion Champions Award; and the Airport Minority Advisory Council nominated MIA for its Catalyst Award for DBE participation of architecture and engineering contracts. Since Mr. Collins joined the Department, the Minority Affairs Division has conducted 387 outreach activities, which are 35 more than its business plan target of 352. The monthly outreach meetings have attracted the attendance of other Miami-Dade County departments and institutions due to the effective way they communicate with DBE, SBE and ACDBE firms. Mr. Collins has a Master of Science degree in management from St. Thomas University and a Bachelor of Science degree in political science and public management from Florida A & M University. Certified Unit - Miami-Dade County's Business Enterprise Certification programs.